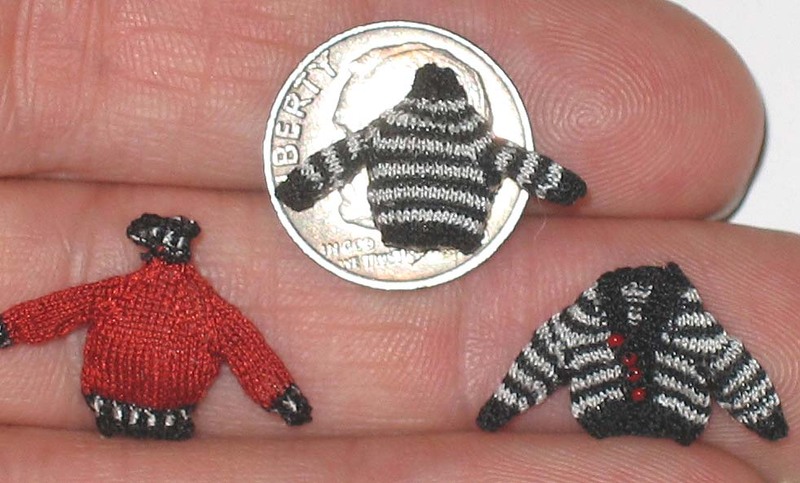 I began making 1:12 knit works using real needles not miniature needles. My first works were very bulky. I created a vest with roughly 30 stitches per inch. I just loved it. It was truly a light bulb moment for me. 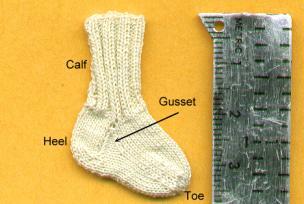 And so, my children’s dollhouse never got built as I became obsessed with knitting in miniature. I made all my works in scale. 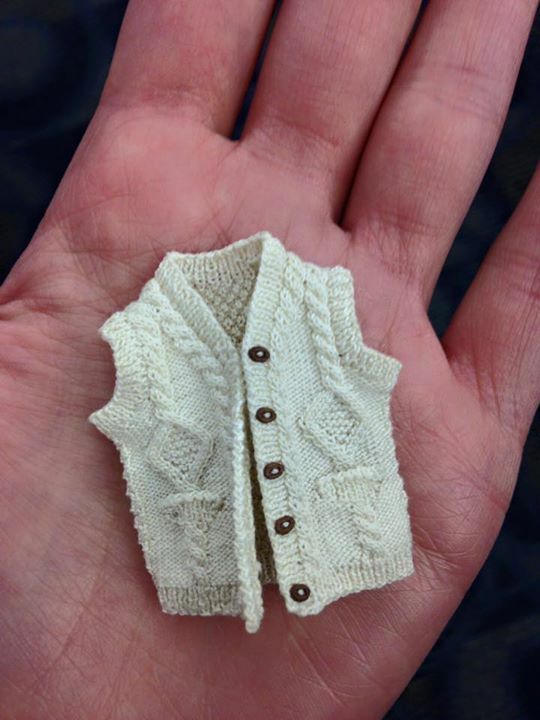 How did you transition from making miniature knitwear for yourself to selling your work? I had never been to a miniature show, nor had I seen miniatures before. The inspiration for my work was all in my head. I wasn’t writing down any patterns. In due time, I went to the closest miniature shop which was 2 and a half hours away. I put all my miniature works in a cigar box and brought them to the shop. The feedback I received was that my work was too bulky. So, I bought something like a small dress form or mannequin which helped with scale. Early on, I tried to sell some of my bulky works on eBay which helped to connect me to lots of people in the miniature world. I was soon asked the question, have you ever tried gloves? My first try looked like a baseball mitt! I’ve saved all of these beginner works, by the way. I was so determined. Then I thought, “well now maybe I’ll use sewing needles.” I had previously tried using tatting needles for lace making. They have an eye on the end and are longer and not as sharp. Then, I started to use thread. I made a pair of gloves. When I joined a miniature knitting and crochet Yahoo! Group, I found Sue Ressuguie. Her knitted works blew my mind. I could stare at her work for hours. She was the first person to mention the International Guild of Miniature Artisans Guild School in Castine. At that time, I started collaborating with Marcia Backstrom, a doll maker. Eventually I attended a show myself – two shows in one year, in fact: the IGMA Guild Show and Tom Bishop. In 2003, I attended the Guild School for the first time and the gloves I donated for the auction sold for $600! How long would it take you to make one of your prototypes from your 24-hour class at IGMA Guild School? For the 2015 IGMA Guild School, the prototype of the fisherman’s cabled vest took me about 1 week or less to make. I worked for about 5-6 hours a day. The fisherman’s rope cable has a moss stitch. There’s also hints of algae and basket weaving in the design. Have you ever made something so beloved you couldn’t sell the work? Over the years I made very special pieces that were very conceptual. I made a Warhol sweater with soup can pockets and the iconic Marilyn Monroe on the back of the sweater. That work is now in the Kentucky Gateway Museum Center in Maysville. Kaye Browning is the Miniature Curator at the museum and she’s purchased a lot of my work. For a period of time when I found I could not knit, a scuba diving trip really helped me get through a tough time. 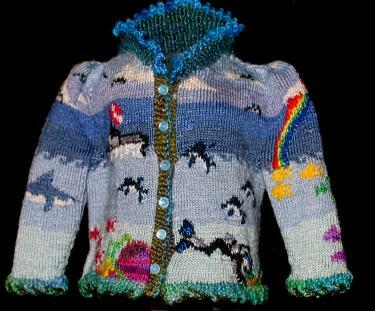 So, I knitted a special sweater all about scuba diving. It has on it a water spout, sharks, a dolphin following a boat, coral, fish, and my diving instructor finding a weight belt. I eventually sold this to Kaye Browning. 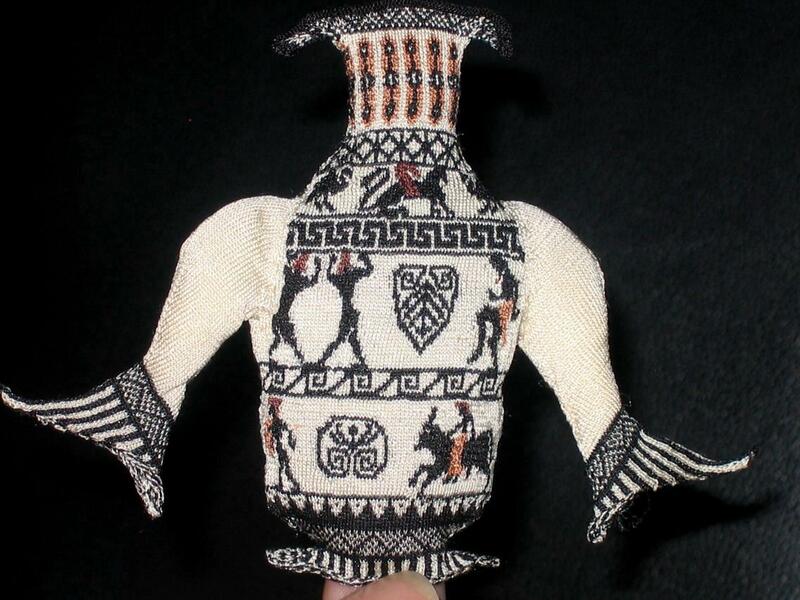 Some of my most special works are art history themed pieces including a work of a Greek amphora, and a Picasso piece. Those were really stand out works. My most colorful creations are 1:12 scale garments, each of which takes about 30 to 40 hours to design and 100-300 hours to knit. What works will you start designing when you go home? I have a pattern in mind right now: a medieval nativity scene based on a triptych. There will be panels in the front. Once I design it, I can knit it. I use a software program that’s a motif maker which pixelates the images. Sometimes I sketch out work or modify existing patterns. Highlights of your knitting career? I received a call from LAIKA Studios regarding making knitwear for a feature film. 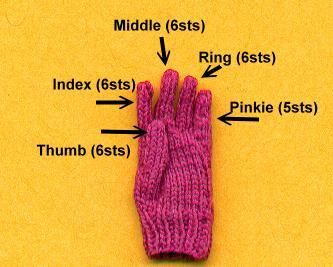 I sewed 14 sweaters and 5 pairs of striped gloves for Coraline. I made the star sweater with sparkles that she wears during the film. I kept the 15th sweater and still have it today! I was on the Martha Stewart Show a few years ago. Everyone in the audience was working on knitting projects. I was in the front row and spoke to Martha on camera, she had a couple of my pieces on a dish. She asked about some of my prices and I had a few minutes on screen. It was so much fun to do that! I’ve also been featured in Ripley’s Believe It Or Not. It was a 2-page spread titled, “Prepared to Be Shocked!” There have been many other wonderful highlights thus far. Advice you’d give to a new artist? Follow your passions and work on what inspires you. Start a website, even if it’s only one page. No matter how basic it is, it will help people find you. Advice you’d give to a new knitter? One of your greatest resources will be a local yarn shop. Just sit and talk with them and listen to what they have to say. They’re knowledgeable when it comes to what yarns or what needles you may wish to try. Advice you’d give to a new miniaturist? Come to the Guild School. I’ve done miniatures and I’ve done other things I haven’t been thrilled about. I always longed to make art or make miniatures. I’m happy now, because my children taught me to pursue my passions. They are tenacious, and keep me creating. 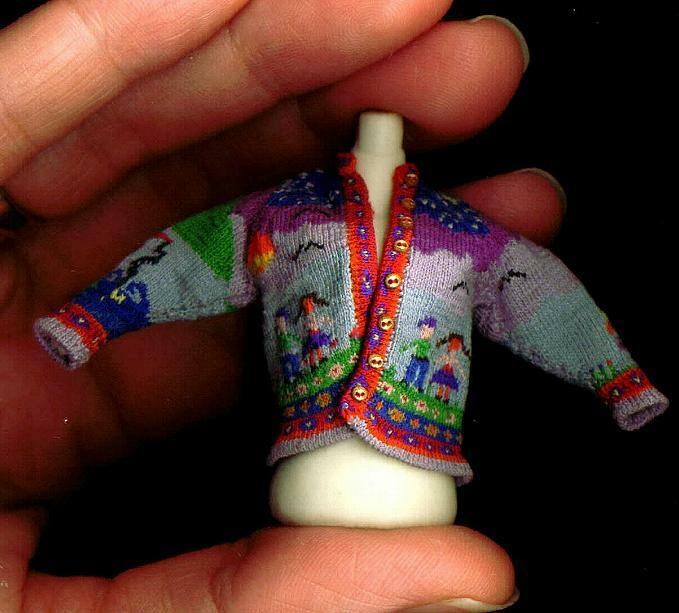 Miniature knitting by Althea Crome has mesmerized the masses of mini enthusiasts around the world. If you’d like to learn from Althea, take one of her classes at the annual International Guild of Miniature Artisans Guild School. 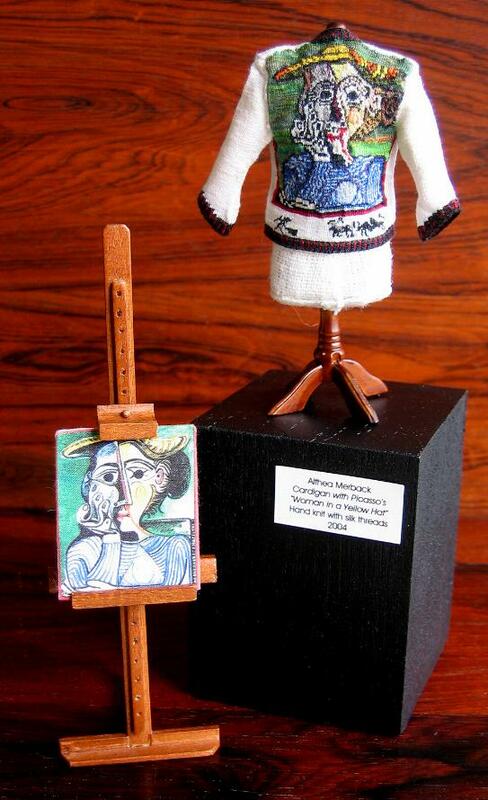 To see more of her miniature knitted works, visit AltheaCrome.com. Daily Mini Interview: Miniatures by Mini Mago Inc.